Whew. We've had quite a week already, haven't we? We've visited a lake, a museum and a temple. So let's go shopping today! Siem Reap, despite being a small town, has three markets aimed at gullible tourists such as us - the Central Market, the Night Market and the Old Market. All three are within walking distance of each other, and very little distinguishes them in terms of products available or even prices. The Central Market gets its name from the fact that it's the closest to the city center. The Night Market, of course, opens only after 6 PM. The Old Market, presumably, is the oldest of these markets. It occupies an entire block off Pub Street. We were told that the Old Market is where the locals shop. That's a little hard to believe, because we didn't see any locals there. And no wonder - the place is full of shops that sell souvenirs of different kinds; there's very little that the local would be interested in. As for us tourists, there are plenty of things on offer, as long as you're willing to bargain - wooden carvings of the famous Angkor face, silk stoles, cheap cotton t-shirts, beautiful dresses, cushion covers, jewellery, women's wear, dried fruits. Since we had just shopped at Chatuchak market in Bangkok, the Old Market seemed a bit small to us. But then how big can such a market be in a town the size of Siem Reap? There are at least a dozen stores that all sell the same thing. Which actually makes it easy for the buyer - you can ask around in a few shops before finally deciding where to buy from. The only part of the market where the locals probably do shop is the food market in the center. 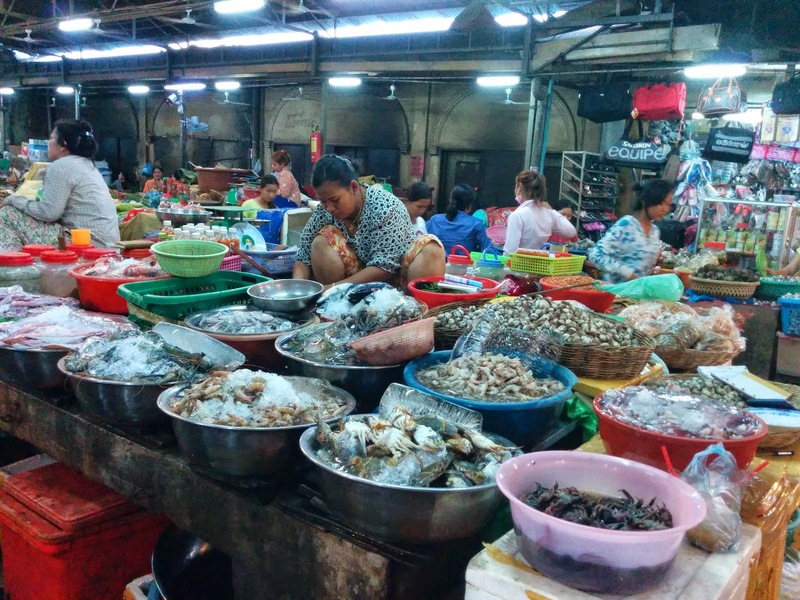 You can tell that you're getting near the food market by the stink - the smell of different types of seafood. I refused to go near the place, but my husband (who loves seafood) ventured in. The place looks colourful, but I wouldn't even begin to know what all these things in the baskets are! A bit off topic from Cambodia - When K and I went to Chatuchak, it started raining, and he was so thrilled that even the Gods did not want me to shop! Which one is better price wise - Chatuchak or Old market? Great post for the letter 'O' :) I've never been to a market like that, what a neat experience to have! Aarthi: Haha! Poor you. I definitely preferred Chatuchak - both for the sheer variety and the prices.